Balancing On My Toes: April Birchbox! Oh gosh, I love getting mail! I've been like this since a young, young age...when I was little I used to set up "mailboxes" in the upstairs hallway of our house and put letters to my parents and brother inside and got really upset when my mailbox had nothing in there. My parents decided to sign me up for a penpal through the American Girl doll club so I would have somebody to write letters back and forth to. That penpal and I still communicate today- she is currently serving in the Peace Corps in Madagascar and has a blog too which catalogs her experience being away serving. My birch box arrived on Friday, however I didn't end up getting it until Saturday since I was out so late with kids at the Bruins game. 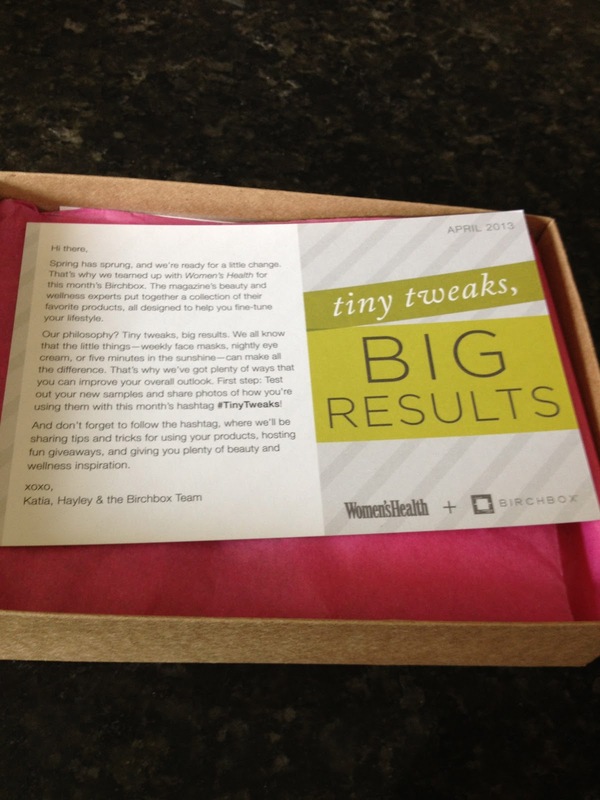 This months theme is "tiny tweaks, big results"
I love looking at the box trying to guess what's inside- gotta love when you see a full size samples inside there! 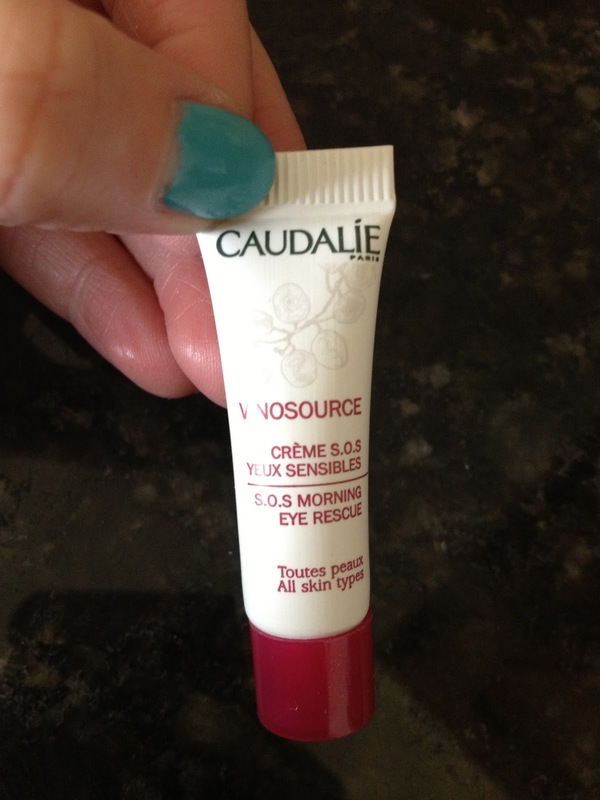 The first thing I saw inside was a Beauty Protector which I am excited to try! I love hair products and I'm always excited to try ones I haven't heard of before! Juice Beauty's Stem Cellular Repair CC Cream was also included in this box. This is a color correcting cream that is part mineral sunscreen and part organic antioxidant serum and part skin-perfecting tint. Well that's what it says on the card anyways. I have been trying different concealers, moisturizers, foundations and other face products for awhile now so it doesn't hurt to try another one! The Caudalie SOS Morning Eye Rescue is something else I'm excited to try- I have been using a Loreal eye cream for awhile now but I'm going to take a break from it to try this one! 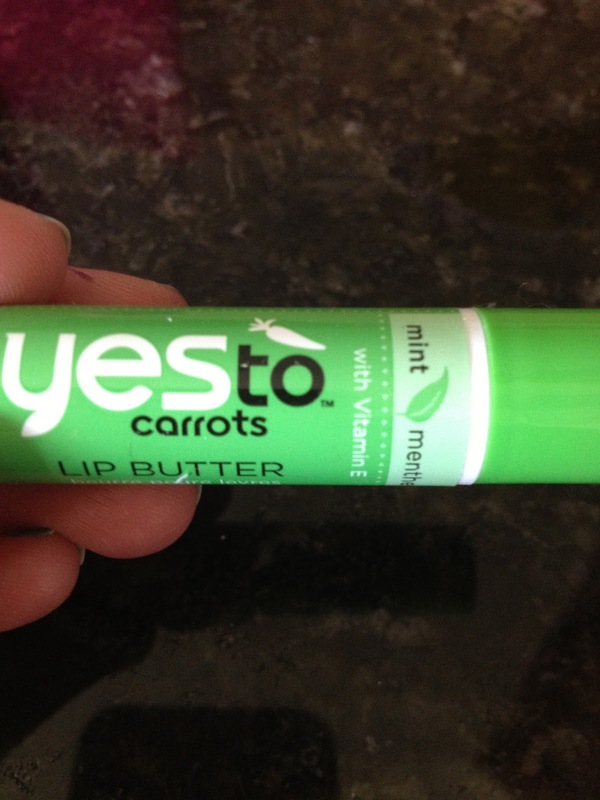 I'm not too excited about this Yes To Carrots lip butter because I am super obsessed with my Burts Bees chapstick. 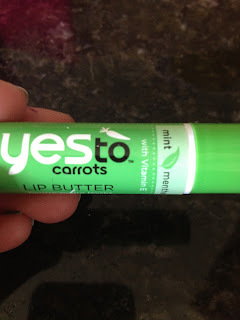 I will try this but I'm betting it doesn't stick long I just can't help my obsession and I'm not a fan of different lip products....we'll see! 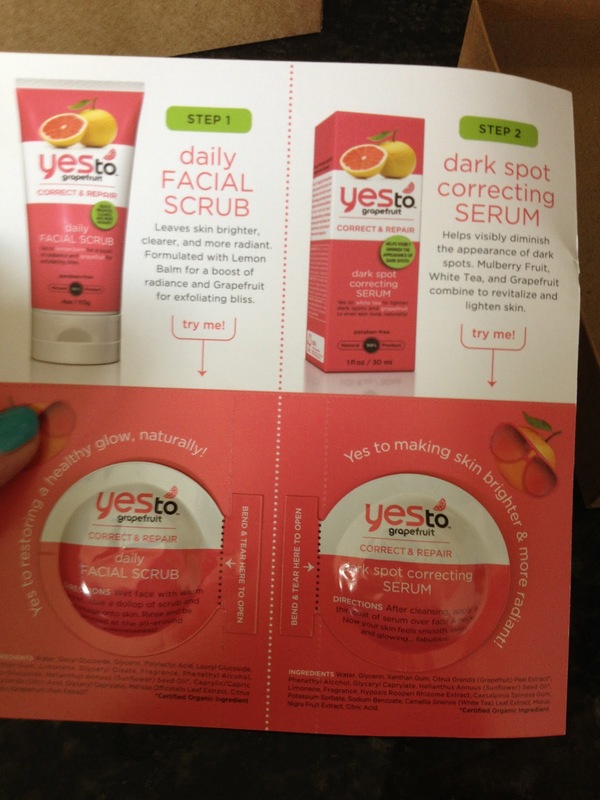 I am definitely more interested in this Yes To Grapefruit daily facial scrub and dark spot correcting serum. This is a really small sample which is a bit of a bummer because I really would like to try this for more than just a day or two. I will definitely be giving this a shot soon! Also included in this box is a year long subscription to Women's Health magazine which I will definitely be subscribing too- I do love a good magazine! 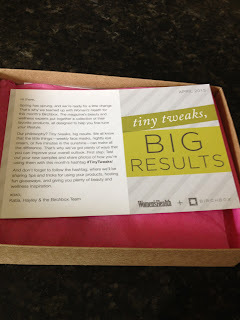 So that's what was in my Birchbox this month- after I've given each item a fair chance I will be back to review it! Do you get any beauty box subscriptions? What was in your box this month?